We have a bowl in our pantry where we collect candy from special events to dole out periodically to the boys. Since it is pre-Halloween, there are slim pickings left in the bowl. The last time I let Buster pick something from it, we were down to a handful of restaurant mints and few pieces of bubble gum. The empty bowl says it’s time for some Halloween. I should pay more attention to what our dishes have to say. Buster envisioned this strange ritual, made and face, and concluded, “I don’t know how to do this one.” He tossed it back into the bowl and took a mint. It will be nice to get some candy the kids understand in the bowl again. On the other hand, Halloween is approaching at a blinding speed this year. I don’t even know what the kids are going to be yet. 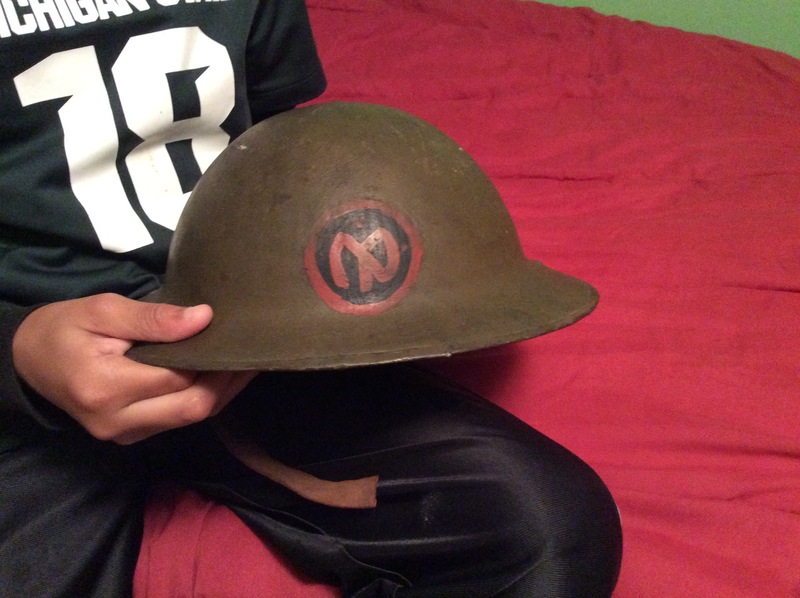 Big Brother mentioned something about being a soldier again, but this year wearing my WWI doughboy helmet. I nixed that idea. It’s a steel helmet, which is going to get heavy on his head in about a minute, and I’m not carrying that thing around the neighborhood. It probably wouldn’t even hold that much candy. The last thing a kid’s going to want on his head for an hour, and an awkward candy carrier at best. Some friends will be Trick-or-Treating with us. It’s more fun with friends, and the other kids will probably have good costumes. Maybe I can slide over toward the friends and kind of pretend we’re not with those kids whose parents don’t care enough to adequately costume them for Halloween. If it’s snowing, like last Halloween, we’ll be off the hook. I’ll just tell my boys to make a show of complaining about how Mommy made them wear their winter coats and hats overtop of their super-awesome costumes. Cold weather is the great Trick-or-Treat equalizer – knocks the Pinterest parents down to my level for an evening. 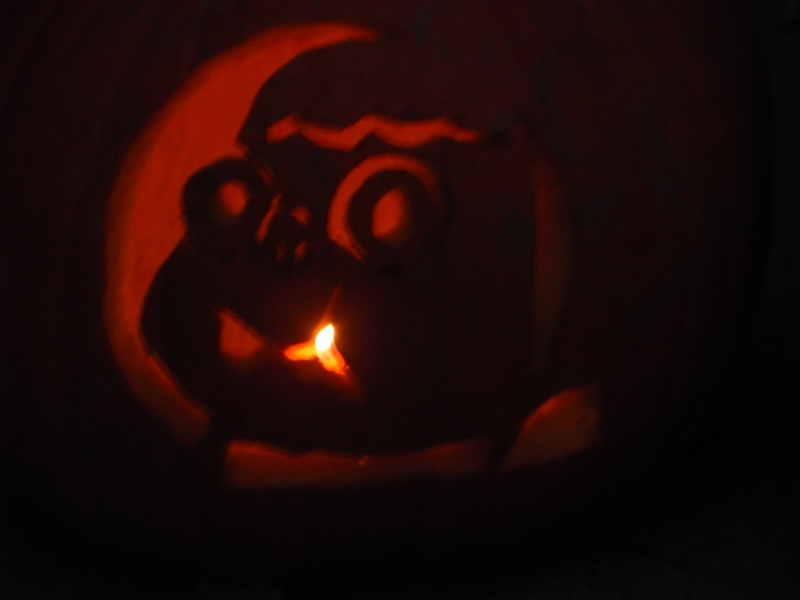 Last year’s jack-o-lantern, because there is no image of this year’s jack-o-lantern yet. This is potentially the first year for Big Man to go Trick-or-Treating. The thing about toddlers is they don’t walk fast enough to maximize the treats potential of the neighborhood, and we’re all about efficiency when it comes to collecting free candy. I learned my lesson about trying to carry a toddler around town several years ago when I wasn’t even as old as I am now, and when the toddler wasn’t such a substantial child as Big Man is. We’re going to have to put him on wheels, somehow. Maybe he can ride in the wagon with Buster, because, truth be told, Buster still slows down the operation, too. Halloween shouldn’t be about a dad yelling at the big kids to slow down and the little ones to hurry up. It should be about friends and fun and treats and showing respect to your dad by giving him a fair cut of your candy for his trouble. That’s the true spirit of the season. This entry was posted in Holiday Hijinks and tagged children, costumes, Dads, family, fatherhood, Halloween, holidays, humor, parenting, trick or treat. It’s not expected, but it does happen. By all means, do catch up. The kids love it. 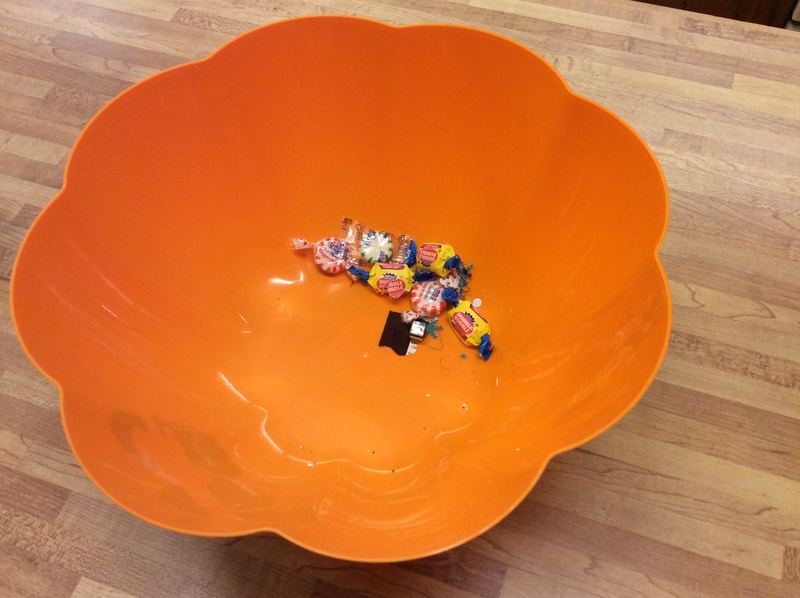 When I first saw the picture of the bowl in the Reader, I thought you had consumed all of your candy prior to Halloween. Oh wait, that is my house! It is tempting and I do have a significant sweet tooth. Forget Pinterest. You have child cuteness to make up for costume deficiencies. Think we can sell “three cute children” as a group costume on Halloween night? Well, they face each other in the wagon, so they’d be some messed up drivers. Don’t worry, I’m getting some candy – one way or another. That would make for an interesting ride! Glad you have your priorities straight with the candy situation. One must be compensated. Kids shouldn’t eat too much candy. I still remember my trip last year, ending up in Georgetown, Washington for Halloween. I didn’t have kids or friends for that matter. Never mind anyone to talk too. I just lurked in the shadows with my camera trying to capture the essence of the holiday, watching families doing the trick or treat thing. And we let you come back? Shows how loose our borders are. That candy bowl looks like someone will have Halloween whoa this year. As for the weather, we’re lucky, gonna be in the 80’s here, can’t imagine Halloween in the snow. Now that would be rough. Good news: no snow expected this year – just cold rain. …and stealing your kids’ candy. (seriously) – okay mom, think we’re done. Oh no, you need to hit that door there, they are giving out the BIG Costco candy bars. Get mommy a Snickers and Reeses, please.